The Undergraduate Association used a "systematic" and "committee-driven" approach to accomplish its goals over the past year, said outgoing UA President Manish Bapna '91 and Vice President Colleen M. Schwingel '92. "By creating all these committees . . . people feel more attached to what they're doing," Bapna said. The result is an "atmosphere that's conducive to producing effective policies and results," he added. Restructuring the UA Council, providing "tangible" services for students, gaining student representation in administration committees, improving MIT food service and addressing on-campus security with a new shuttle van were among the major issues the UA addressed during the past year. Restructuring the council, which Bapna and Schwingel emphasized was the most important issue of their tenure, involved establishing several new committees. The UA created the Standing Committee on Student Life and its subdivisions on alcohol policy, financial aid and medical programs, the Food Service Committee and the Governance Committee. The UA Governance Committee, representing the second major issue the UA dealt with over the year, strived to place student representatives on Institute committees which in the past have not included students. That committee's efforts so far have "opened the door; we're still now fighting to get representation as far the calendar changes that are going on," Bapna said, referring to changes in the Institute Calendar this year that lengthened the spring finals period by eliminating three Institute holidays. Bapna said, "I think a lot of students still wonder, how effective can the UA be? I think we realized some of that potential this year." He added that the Governance Committee's next target will be the committee that will review tenure policy at MIT. This committee, which has not yet been formed, resulted from the recent settlement of a suit against MIT by former Associate Professor in Science, Technology, and Society David F. Noble. And referring to the UA Food Service Committee's efforts to improve MIT food service, Bapna said, "I hope people realize that word for word our proposal was taken into the contract." MIT recently approved the UA's proposal for next year's board plan. Schwingel said, "One committee that [has been] empowered this term has been alcohol. Although the report isn't out yet, that will dramatically affect student life." She added, "[The] Dean's Office is looking to the UA for direction . . . rather than looking internally for a solution." Schwingel said that when an alcohol policy is "is passed through the council, . . . [it] will be the alcohol policy, or very close to it." Over the past year, Bapna said, the UA Financial Board has "refocused its views on what it should be doing." FinBoard is now acting as a financial consultant to provide "services for students, primarily shuttle bus, and now working on credit union," he said. The team noted that attendance at UA Council meetings has increased during their tenure. Schwingel said attendance is at "an all-time high." She attributed it to increased participation in the UA: "Council members feel that they're doing something -- we use them to gather information for us [and] bring information back from dormitories." She added, "That's been our challenge." Bapna said the council is still evaluating student representation on the council. "We're investigating what mechanism [for representation] is the most effective." Bapna and Schwingel felt that housing, academic computation, IAP and Institute Calendar changes would be the most pressing issues in the coming year. 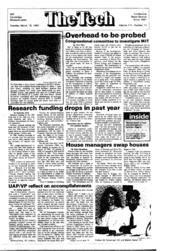 Bapna felt that even though the Freshman Housing Committee's November 1989 report -- which called for a drastic restructuring in undergraduate housing, including housing all freshmen in dormitories -- has remained dormant, it will become an issue again. "I think most people are quite aware of . . . [the] report and its recommendations; people realize it's going to be quite an issue," he said. sors, freshman and departmental advisors.